The TechPro Medical Billing Service operates as a virtual extension of your practice – allowing you to off-load the complex and time consuming billing and collection process while still retaining full communication and supervision. Our billing service solutions come with a dedicated account representative who will be YOUR contact point for assistance and support. You get an assigned specialist to help you make the most of our solutions. In this way, we enhance your staff’s capabilities, augmenting their efforts with a team approach that provides consistency and prompt service. Get paid better, faster, experience a stronger, more stable cash flow. Transparency, we provide timely reports, so you know status at all times. We are paid only on what we collect, so your success is our success. You are reimbursed directly by all third party payers; we bill you. Redeploy staff to focus on better care and customer service. You have the option to choose the solution that’s best for your practice. The TechPro Medical software can be installed on your hardware or you can access our secure site. This allows your staff access to patient demographics, balance information, and appointment scheduling while TechPro Medical handles all claim processing and payment reconciliation. 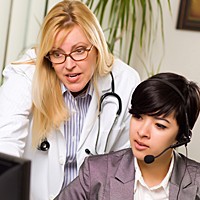 Why TechPro Medical Billing Service? Our Focus is to increase your cash flow and profits. Our clients are thrilled with the quality of our work. Compliance driven policies, procedures and practices. See what TechPro Medical can do for you.